I have been a long time user of Dynamic DNS service provided by the DynDNS. I had no issue with using their service until they stopped their free offering. I have continued with them for about a year and since it’s coming up to renew, I started looking at alternatives and here is a brief blog about my learning in hope that it could be beneficial to someone in same boat. Below is an general industry knowledge on how DNS services are sliced for anyone keen to utilise different providers for each layer. The reason for such offering is driven by the customer demand either to decrease in operating cost, vendor preference or technically suitable solution. Domain Registrar: Are the ones who are responsible for your domain registration. Think of this service as yellow pages, where you can find business name to telephone number mapping. As you can see from the above diagram that example.com is listed in nameserver1/2/3/4.com. Basically when someone searches for example.com any of the nameserver1/2/3/4.com will return the IP address of your web-server. This servers are authoritative in nature meaning they will overrule any cached values in downstream DNS servers. So when you buy a domain, you would generally get an option to set your authoritative nameservers and by default they would have default values filled with nameserver offerings from your domain registrar. 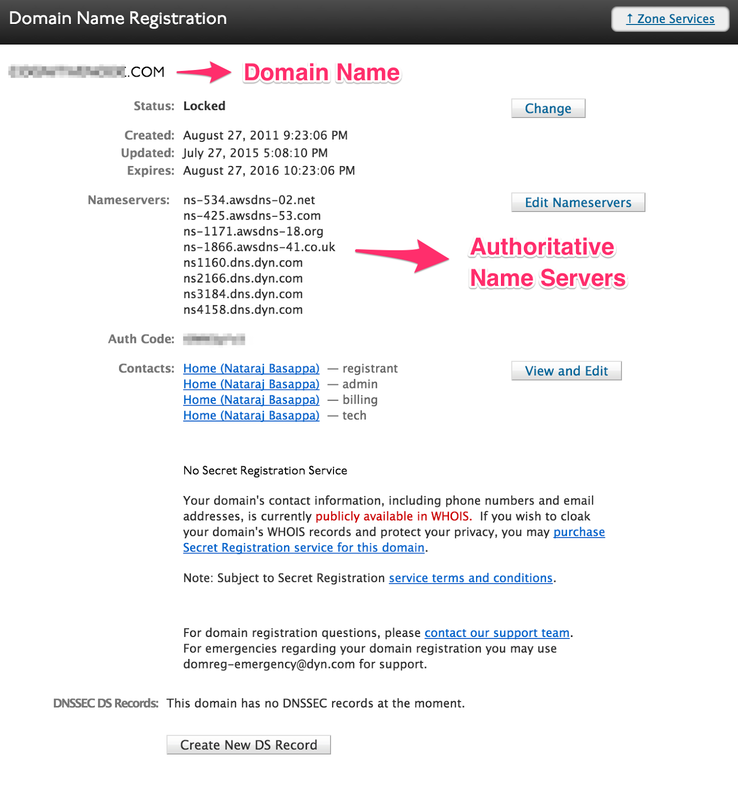 A screenshot from DynDNS dashboard showing whats basically your annual charge to domain registrar entitles. Name-Server provider: Strictly speaking this is a secondary or auxiliary function to domain registration. The nameservers basically will hold your web-servers current IP address pointing to your domain name. As from our diagram above we can see that nameserver1/2/3/4.com all of them have a tuple/record that basically holds example.com mapped to 86.183.48.227 IP address. So when a request is made to example.com the authoritative nameserver’s in our case anyone of nameserver1/2/3/4.com will give out the current IP address 86.183.48.227 to the requestor. See screenshot from Amazon 53 which provides Name-Server service. ISP: They provide the IP address for your web-server. Most ISPs offer static and dynamic IP addresses, targeting different market groups. Generally speaking static IP addresses are tad expensive compared to dynamic once as they are geared towards businesses. Whatever the IP address your ISP may allocate, you would need a way to update the same to your authoritative nameserver. This is one time job when your have a static IP, but if you are getting a dynamic IP then you may have to find means to update your nameserver on every change. From our diagram above ISP has allocated an IP address of 86.183.48.227 to our web-server, which has been updated to our nameserver provider.